Teaching with TLC: The most delightful spring book! The most delightful spring book! 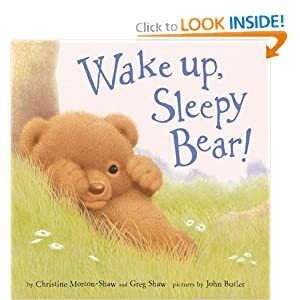 Today I read Wake up, Sleepy Bear by Christine and Greg Shaw for the first time to my younger boys since we have been doing spring activities. This book was so adorable and the illustrations of the baby animals are just beautiful. Write this title down on your wish list for your young child (2-8 years old). This book would even be perfect for an Easter basket. You can do this extension activity after reading this book if you have a small group of children. Have all the children sit in a circle. One child will sit in the middle and pretend to sleep all curled up like a bear hibernating. Make sure his eyes stay closed. Pick a child and have him quietly sneak up and touch the bear then quickly return to his spot in the circle. Everyone in the circle says "WAKE UP SLEEPY BEAR! WAKE UP!" The child (sleepy bear) sits up and guesses up to three times who woke him up. Choose a new bear if the child does not guess the correct person. If he does choose correctly, the person who tapped him has to be the new sleepy bear.